The landscaping in the backyard of your home says something about you. It should stand out because it’s the heart of all entertaining that goes on outdoors at your house. Here in Minneapolis we like to get outside in the summer, but it often gets too hot in the bright sun to stay long. To make your outdoor spaces more usable, consider installing something to provide shade. When it comes to covering a space in your backyard for entertaining, you’ve got lots of options. You want something that shows your style, but also that works with the look and feel of your home as well. 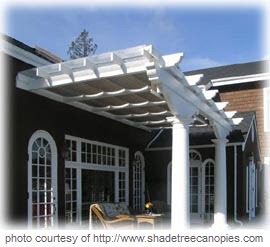 For shade you can choose something like a pergola that diffuses sunlight, but if you’re looking to block out the sun as well as provide some protection from light rain, an outdoor awning or canopy might be right for you. Units can be permanent or temporary. Some are retractable, others are free-standing, while some can even be integrated into a pergola. Have cookouts and entertain no matter what the weather is; you’re protected under the covering. If your patio is adjacent to your home, you can save money on your air conditioning bill in the summer months because it stops the sun from directly shining in that one particular part. Adults and children alike can sit in the shade of the covering and not have to worry about the harmful UV rays from the sun. They are a beautiful addition to the back of your home, that can even increase the value of your home when it comes time to sell it. They come in many different styles, colors and sizes to choose from to match the look of your home. While price and style are definitely considerations, here are other factors you should take into account when selecting a shade covering for your outdoor room. Know how much space you have to work with; you can have a little awning or a big one, depending on the space available. Choose the right material that is not only resistant to the sunshine but also is going to withstand our sometimes harsh Minnesota weather. Do you want an awning that can be taken down, or one that is constantly in place throughout the year? Consider the materials so you can have it match the look and feel of the home on the outside. You do not want it to stick out like a sore thumb but mesh well with its surroundings. Here are Architectural Landscape Design, we love helping homeowners around the Twin Cities get the outdoor rooms of their dreams. We can design your space and install all the necessary elements for a backyard spot that’s just perfect. We are a licensed MN landscape design and installation contractor. Call us today to schedule a free initial design consultation. Let’s get the plan going now so when the warm weather sneaks up, we can get right to work!